I am a 47 year old professional that has been working in the development sector all my life. I never ‘did’ conferences. There were various reasons, but it mainly related to my doubts regarding the value of research that is constantly produced, but never translated into a language that lay people can understand easily. That was my little bugbear! In 2013 I was offered an opportunity to attend a conference on ageing which I (surprising even myself) grabbed with both hands. At this point I was desperate to be in an environment that addressed issues affecting older persons beyond their immediate needs, in order to give perspective to my experience working in the older persons sector in South Africa. My first, ever, conference was the International Association of Geriatrics and Gerontology (IAGG) Conference in Seoul, South Korea. What a wonderful first experience – filled with learning, networking, growth in understanding and the experience of collegiality around a shared and common commitment. The work and progress shared by those working in eastern and western developed and developing countries was impressive, offering much to learn from. In 2014, I looked for a similar experience. Since mental health has been a strong focus of our work with the elderly over the last two years, I decided to select that as the theme of my learning experience. I was advised that the conference to attend on mental health is the International Alzheimer’s Conference. My ability to learn and engage at this conference was so different from my previous experience. I attended presentations that addressed models of care, which I was really interested in, but little of it seemed applicable to our local conditions. My experience was tainted by an ‘inability to identify’. I did not get to meet any other African delegates to discuss how issues in the various contexts are experienced and solved. Ageing and mental health are global experiences, how then are opportunities like these- aimed at increasing knowledge and shaping responses- excluding lessons from large populations of older people? As Africa’s population grows, so does the number of older people. Traditionally, extended families have taken care of elderly members, but that’s now changing, which means that ageing Africans are facing new problems. I felt left at the conference as a single voice for Africa, wondering how one influences the space and contribute to the discussion when so little seemed applicable. Contemplating whether perhaps the international perception is that the African elderly live happily with their extended families, fuelling a lack of funding for research on the content? And being perplexed as to why this conference was so different from the South Korea conference in terms of African presence? 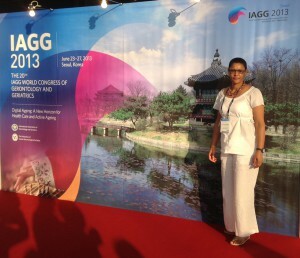 The IAGG made grants available for African participants to attend – perhaps that made the difference? The importance of contributing to spaces that are dominated by perspectives not informed by common and shared experiences; such contributions could impact the value of the solutions reached and the depth of discussions. International conferences are not always the best places to learn; regional or national conferences might be more useful because information shared there is designed to be relevant to the local conditions. That said, I have learnt to appreciate the value of learning that conferences provide (despite my considerable doubts in the past). I will however choose the conferences that I attend more carefully in the future. ‘International’ i.e. bigger does not always mean better! I have it up to here with research and funding organisations. No wonder that a lot of knowledge produced through research is collecting dust in libraries. Only experts can understand it. But often the experts, the consultants are not practitioners. So is it not ironic that when we want to solve development problems we turn to these people, these non-practitioner expert-consultants. We never turn to those who experience the problems in their everyday lives. Sure, the experts will produce the fancy charts for us. But no one else except them understand the fancy charts. Let alone the people we seek to help. Experts and researchers have hijacked development from the people. Development has become ‘elite-sized’ so that laypeople are excluded from development decisions. The result of this hijack is the continued reproduction of the current unequal social order — the privileged continue to get their privileges — the under-privileged continue to languish in their condition. It’s just not fair. This pattern is prevalent throughout the development industry. Brave comment David – but I absolutely agree. After 1994 the development arena was completely hijacked under the guise of “professionalising” organisations to achieve “self sustainability” which the North imposed on us knowing their funds were to be stopped. Suddenly all these experts and expats descended upon us; coming into an organisation, filling it up with totally unachievable nonsense, completely missing the point and then leaving the organisation fractured and worse off with no realistic plan for recovery! As for the gathering of the elite clans at so-called conferences – it is beyond embarrassing.